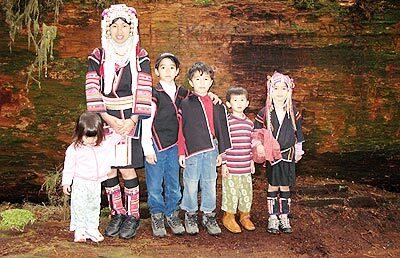 The beauty of the traditional Akha tribal costumes. Here in the north of Thailand there are many foundations, both religious and secular, who are working with the numerous hill tribe peoples who have settled in the kingdom over a long period of time, either as a result of being driven from their homelands or as a result of natural or economic migration. Many of the groups are impoverished, with the majority living in villages in mountainous areas far from schools and medical facilities; however, all of them have indigenous cultures and traditions which are of immense value, both in the historical and the ethnic sense. Obviously, these traditions include religion, which varies from animism through forms of Buddhism, often resulting in combinations of belief dependent on the original locations of the ethnic groups themselves. Family values and the closeness of family groups also figure strongly. However, as the modern world encroaches, even into areas which are inaccessible in the rainy season, the need to incorporate its positive aspects becomes ever more clear, particularly to parents, who, as does every parent worldwide, want the best for their children. The resultant conflict between cultures and traditions which bind hill tribe communities together and the perceived lifestyle of partially westernised city dwellers leaves the ethnic communities in a vulnerable position as regards outside influence. Education of the next generation is a priority, with many groups’ villages located at great distances from even the most basic schools. A number of foundations are at present providing schooling combined with boarding facilities for children whose home villages are many hours’ walk away. The majority of students stay at the school during the week, returning to their villages on weekends and for festivals and traditional celebrations. In this manner, they are still connected with their tribal community and their extended families. Other organisations seem to prefer to remove children entirely from their families and cultures on a permanent or semi-permanent basis, placing them in children’s homes or ‘orphanages’, distant from their home villages. Parents are encouraged to allow this by the promise of free education. Given this situation, if the practice continues it seems possible that tribal culture, tradition, value systems and religious preferences may be permanently lost, with the risk that they will be replaced by aspects of western civilisation unsuited to the people themselves and their culture. A somewhat controversial foundation which is strongly against the removal of Akha children from their home villages recently began a trek across America from Oregon, in support of the human rights of Akha tribespeople. The Akha Heritage Foundation, headed up by Matthew McDaniel and his wife, herself Akha, has been working since 1991 in Chiang Rai and Chiang Mai provinces, home to a number of Akha villages. The aim of the foundation, based in Oregon and Chiang Rai, is to defend the human rights of the Akha people, to assist with medical and educational needs, and to promote their self-determination. Matthew believes that the security and well-being of Akha communities must take priority over ‘development’ by outside interests. Activities include the publication and distribution of books in the Akha language, monitoring and photographing human rights situations, mobilising support and donations across the USA, and supporting and developing sustainable economic opportunities for the Akha. In short – results-based activism. Matthew’s latest journey of human rights support involves two people – himself and his wife, one large and reasonably comfortable bus with ‘Ride for Freedom’ emblazoned along its side, and one horse, Hampton, Matthew’s mode of transport throughout the long journey. The trek began in Crescent City, Oregon, in March, and will wind through Arcada, Redding, Chico, Oroville, Marysville, Sacramento, Stockton, Fresno, Bakersfield, Los Angeles, Riverside, Palm Springs, Phoenix, Texas, New Orleans, Atlanta, Washington D.C., finally ending in New York. It’s hard to imagine the time, effort, planning and finance involved, and even harder to imagine what Hampton will make of the Big Apple when they finally arrive! Along the way, the intrepid pair and their even more intrepid horse will increase awareness of their mission to the Akha everywhere they stop, and will make peaceful protest concerning human rights abuses at various venues, including the Thai Embassy in Los Angeles. So far, the trip has had its ups and downs; the ‘ups’ include the kindness and generosity of local people along the route, including an old Oregonian Vietnam Vet, who apologized for ‘all the stuff that happened to the hill tribes during the war in Vietnam and Laos,’ the terrific turnout for their presentation at Humboldt State University on Akha Human Rights, and a case of tuna donated by residents of Fortuna…no pun intended! The ‘downs’ included one very sick horse, suffering from herbicide poisoning after breakfasting on newly-sprayed roadside grass, and an attempt by an unsympathetic local sheriff to impound the by then recovered Hampton for eating grass in front of a factory Matthew was planning to visit. Many more ups and downs, no doubt, will come as the journey progresses, but the determination of these two activists for Akha human rights simply won’t be beaten, and the awareness and, hopefully, funds raised during their journey will mean a lot to the Akha villages, the way of life and the people they support. In this modern world, we ignore our own heritage of culture, traditions and values at our peril. Unless we belong to our own roots, we have no way of going forward. Across Asia, the value of tradition and roots is generally far more highly regarded than in the West. Do those from a totally different world who impose their way of life, culture and beliefs on such diverse peoples have any idea what their target cultures may lose as a result? Do they care? And what gives them the right, when others are improving the tribes’ social conditions and economic opportunities while leaving the people themselves to decide, in freedom, on their lifestyles? As if that weren’t enough, on May 16, APIS will host an amazing inter-school ‘Battle of the Bands.’ Here’s how it all started: With a meeting of local representatives of the Music Teachers of Thailand Association, which decided that talented youngsters deserve the opportunity to perform in public, to experience the electric energy generated during a real, live performance, and to compete against their peers in other schools on a Big Stage. Consequently, the schools joined forces and created the ‘Battle of the Bands,’ the regional final of which will be held at APIS. Each participating school has already chosen its superstar quality contestants, by means of a carefully thought-out selection process, modelled on that used in the American TV programme of the same name. On the night of the finals, an independent external panel of judges will choose the ultimate winners, who will be awarded the grand prize. Their school will hold the title for 2009/10, until next year’s contest. Tickets for ‘Battle of the Bands’ cost 200 baht (100 baht for children and students) and are available from the participating schools, AMIS, Prem International, Nakorn Payap International, Lanna International and Chiang Mai International. Seats can be reserved by calling or emailing Syd. Tickets will also be available at the door. For those who have no idea where APIS is located, the directions below may help. From Airport Plaza, head south on the Hang Dong Road, straight ahead at the Big C traffic lights. Passing Macro on your left, continue to the next, large intersection; turn right to Samoeng. Cross the Canal Road intersection; the road will now bend and twist for approximately 17 kilometers to your destination. Look for signs to the Suan Bua Resort on your right; park there. Ushers will direct you to the school’s auditorium. For those who are still confused, please visit http://apis.ac.th/index.php. You will find a map on the Contact Us page. Stephan Turner, director of Chiang Mai’s Gate Theatre, is still looking for three thespians to star in his forthcoming productions of The Homecoming and The Odd Couple. The parts as yet uncast are Oscar (The Odd Couple), nationality and race unimportant, and Lenny and Joey (The Homecoming), for which a British accent is required. Please, guys, call Stephan on 087-177-2195 and arrange to audition.